One of the easiest ways to treat your skin is with skincare pads – no need for water, or the precise application of gels, but all you need to do is swipe the pads across your face, or the area of concern. 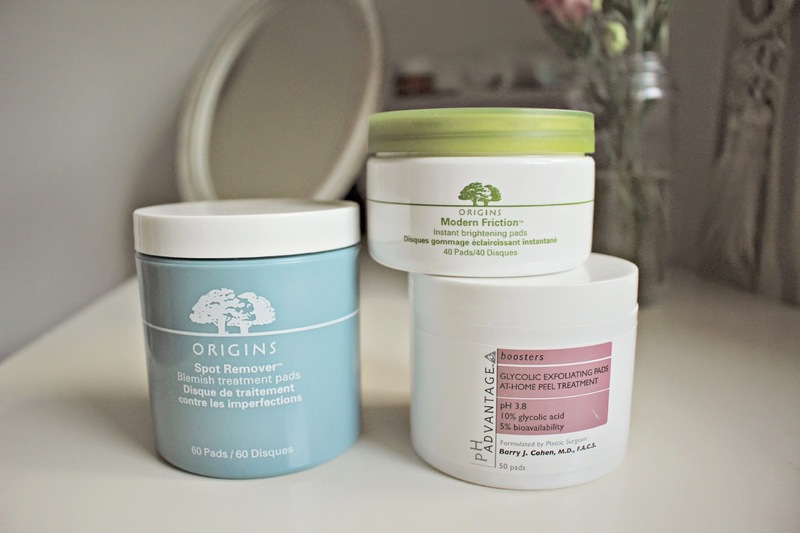 Three of my favourites include the Origins Spot Remover Blemish treatment pads, as well as their Modern Friction Instant brightening pads, and a brand I’d not tried before; pH Advantage whose Glycolic Exfoliating Pads are hailed as giving the same results as a £300 facial. Visibly, they are all the same, but each of the pads give different results. Firstly, Origins Modern Friction Instant brightening pads – they are formulated to improve skin’s texture, tone and clarity and have been likened to giving similar effects as a chemical peel. They are however still gentle and non-irritating and the formula is designed to loosen surface cells, smooth skin and restore vibrancy. 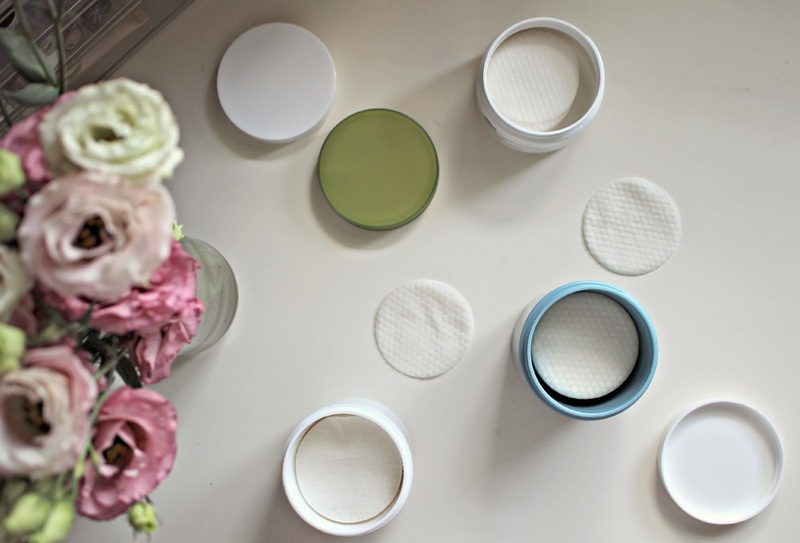 I use the pads once a week – it’s said that after eight applications the skin is visibly more even toned and I’d say my skin does look ‘plumper’ and smoother in appearance, but I can’t comment on whether it’s definitely the pads. I do however feel as though the pads give a deep cleanse – I use the pads in circular motions and that tingly feeling hints to me that something is working! They are £31 for 40 pads, so not cheap, but if you are thinking about investing in an expensive facial, I would highly recommend trying these out first. The Modern Friction Instant brightening pads are £31 from Debenhams here. The next product which I’m loving, also by Origins, are their Spot Remover Blemish treatment pads. I don’t suffer hugely from spots but I do tend to get some annoying bumps on my forehead and the occasional spot which takes forever to go away. The pads have been formulated based on their Super Spot Remover Blemish Treatment Gel – which is my go-to product when I have a breakout, so I held high expectations for the pads too. The pads are saturated with blemish treating liquid and have different textures on each side to let you choose how much exfoliating action you want. The Salicylic Acid gently exfoliates skin and also helps to dry out blemishes. Clove and Oregano help to unblock pores and Saw Palmetto minimises excess oil production. I only use the pads when my skin is bad – and the I use one in the morning, and one in the evening. It’s £24 for a pot but they are very effective – a quick and nifty way to reduce your problem area. I’ve had my pads squirrelled away in my bedside table for a couple of months now and they have not dried out at all – they are ready for action as and when future blemishes appear! Origins Spot Remover Blemish treatment pads are available from Debenhams at £24 here. Finally a brand you may not know of unless but definitely needs to be on your radar – pH Advantage. With products developed by world renowned plastic surgeon, Dr Cohen, the pads contain more Glycolic Acid than any of their competitors, while still being gentle on the skin. The pads, like the Origins Modern Friction are hailed as giving an ‘at-home’ mini peel treatment and the key difference between the two is that the pHadvantage pads contain a higher concentration of Glycolic acid, so much so, that you are required to rinse skin five minutes after use. I definitely notice that my skin looks smoother and clearer after a few uses and my night cream and moisturisers are absorbed better. I have only used the pads once a week, but when the Origins pads run out I think i’ll step my routine up a notch by using these once weekly. The pads are available online but do some comparisons as I’ve seen the price varying across different websites. They are £55 from pH Advantage here. Have you tried any facial skincare pads? Which should I try next?